The number of locally based brands and firms showing their monetary support for this year’s Pink Dot SG 2017 has risen substantially, from five in 2016 to 50 this year so far. The sponsorship tiers are currently in three main tiers, Fuchsia (SG$10,000), Coral (SG$5,000), Rose (SG$1,000). Current Fuchsia sponsors include Chuan Pictures, Collectors Contemporary, Hood Inc Productions, RJ Paper and Wood & Wood. The brands under Coral sponsorship include ShareTea, The Lo & Behold Group, Taste of Tradition and The Analog vault. Meanwhile, notable Rose sponsors include Bar.Nkd, Clover Films, Fry, Overeasy, Loof, Pho Shop, The White Rabbit and others. Marketing has reached out to several of these brands for comment. When asked by Marketing if this initiative will help see its business gaining more support with the LGBT community and hence more pink dollars, a Collectors Contemporary spokesperson said that the company’s support of Pink Dot 2017 is humanitarian based. Hence, it does not think that this exercise will necessarily increase its LGBT customer base. Moreover, he said, its decision to participate was not for this purpose. “Our business caters to anyone who wishes to acquire art and this appeal reaches all people regardless of their sexual orientation or personal moral standing. Our involvement is simply in support of a campaign to promote the fundamental human right of all people to live and love freely. It is hard to accept that a basic right as such can encounter objection from anyone in a civilised society,” the spokesperson said. Agencies in the advertising world have also lent their support with Goodstuph and Xpointo coming in as a Coral sponsor while PPurpose, a TSLA company, comes in as a Rose sponsor. We have a long way to go before we see vendors at Pink Dot going ‘M’am do you have a PAssion card?’ but baby steps, baby steps. This year, all the companies which have chipped into Pink Dot SG sponsorship are local. According to a Pink Dot SG spokesperson, local is defined as “more than 50% of the business is Singaporean controlled or owned”. Currently the campaign hopes to rope in 100 corporate sponsors and raise SG$150,000 in total. Pink Dot declined to share how much has been raised so far. The full list of sponsors is available on Red Dot for Pink Dot, the website for Pink Dot sponsors. “We are extremely grateful and touched by this effort from the local business community. 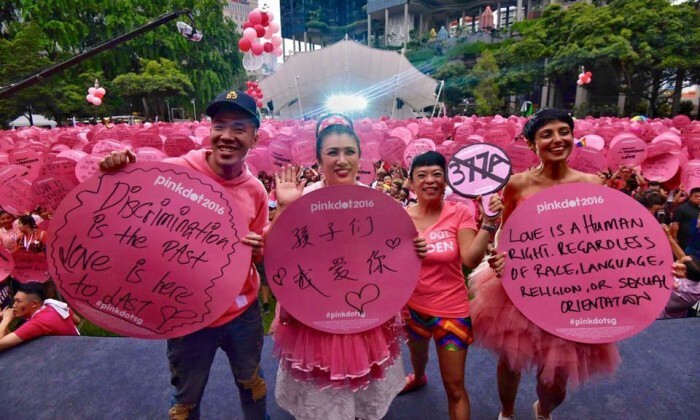 Pink Dot SG has received a lot of love and support from our sponsors over the years, and this Red Dot for Pink campaign has shown that there are Singaporeans who feel strongly about the importance of the freedom to love, diversity and inclusiveness,” a Pink Dot SG spokesperson said. The move follows the harder stance the Ministry of Home Affairs (MHA) took last year against foreign entities’ involvement in events held at the Speaker’s Corner. Last year, Pink Dot SG event saw the doubling of corporate sponsors to 18. Many of these sponsors were global brands such as Apple, Clifford Chance, Facebook, General Electric, Microsoft, NBCUniversal and Visa. Returning global 2016 sponsors for the annual rally were Google, Barclays, J. P. Morgan, The Gunnery, Goldman Sachs, BP, Bloomberg, and Twitter. Meanwhile, local sponsors went from one in 2015 to 5 in 2016. The event agency has risen quickly to first place to edge out two-time gold winner Uniplan Hong Kong in the event category this ye..